Summer intramurals and camps could go a long way if the Lady Eagles hope to remain one of the top team in Sunrise League when the high school girls’ volleyball season begins in late August. The Lady Eagles have spent the past few Wednesdays in the school’s gym going through voluntary intramural drills. But there are more summer events ahead. 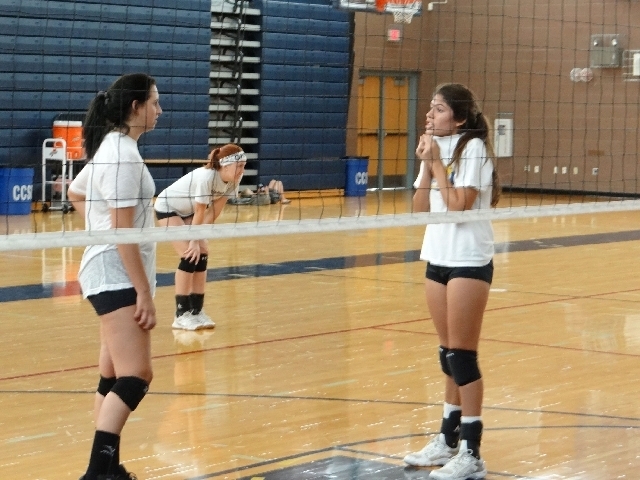 There are two remaining intramural sessions, July 31 and Aug. 7, in the school’s gym from 12:30 to 2 p.m.
Boulder City is having its annual summer camp from 8 a.m. to 3 p.m. Aug. 12-14, with visiting coaches from All American Volleyball. Many of the Lady Eagles are attending additional volleyball camps in Las Vegas, California, Arizona, Utah and Illinois, Hinman said. Tryouts for the Lady Eagles’ volleyball squad are from 8 a.m. to 11:30 a.m. Aug. 19-21. To try out, athletes must have completed a physical and an insurance packet. Last fall, the Lady Eagles were 28-8 overall and 12-0 in the Sunrise League during the regular season. They were upset by Chaparral, a team they beat twice in league play, in the Southern Region semifinal. Hinman was chosen the Sunrise League Coach of the Year. They have made the playoffs for 16 straight seasons, but a three-year state appearance run ended last season. The program has won four state titles, the last coming in 1989. Seniors Whitney Barlow and Kendall Miller will lead a talented returning group. Barlow was a 1-A all-Southern Region selection last year at outside hitter, and Miller made the all region, second team as a libero. Hinman said senior Kaylin Koltyerhan, and juniors Lauren Pocius and Kinsey Smyth should also be leaders. Other players with experience from last year’s team are junior Mickaela Brown, senior Savannah Morris, junior Alyssa Ybarra and junior Katlyn Daly. The team will also welcome newcomer Velzani Moncayo, a sophomore. A strong group of underclassmen are also on the way up, if not this season. “And we have a strong incoming sophomore class from the undefeated freshmen team last year,” Hinman said. The team has a big hole to fill in the middle. Gone from the setter position is four-year starter Avalon Frantz. Frantz, who made first team, all state twice and second team once, will play this year for Division I University of Houston. Also gone is outside hitter Mallory Bird, who was second team, all region last year. Boulder City opens the season Aug. 30-31 at the Las Vegas Invitational. The team’s first home match is at 6 p.m. Sept. 12 against Faith Lutheran. The Crusaders won the Southern Region championship, qualifying for the state tournament with Chaparral. Lady Eagles open league play at Desert Pines on Sept. 19. For the first time under Hinman, Boulder City will be hosting its own invitational tournament on Sept. 20-21. Currently, 18 teams have committed to play, Hinman said. Boulder City will compete in Sunrise League against Chaparral, as well as last year playoff qualifiers Moapa Valley and Sunrise Mountain. Other teams in the league are Desert Pines, Tech and Virgin Valley. Rachelle Huxford returns for her third season as a varsity assistant for the Lady Eagles and newcomer Kelly Lehr will be the freshman coach. Lehr has formerly coached at Las Vegas Day School and at the club level. For more information, go to www.bouldercityvolleyball.com.